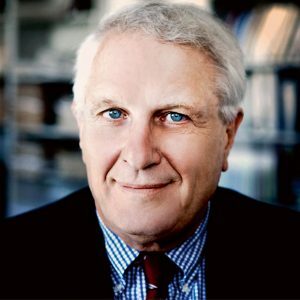 Josef Joffe, the Marc and Anita Abramowitz Fellow in International Relations at the Hoover Institution, is publisher-editor of the German weekly Die Zeit. Previously he was columnist/editorial page editor of Süddeutsche Zeitung (1985–2000). His areas of interest are: U.S. foreign policy, international security policy, European-American relations, Europe and Germany, and the Middle East. His second career has been in academia. Currently, he is adjunct professor of political science at Stanford, where he was the Payne Distinguished Lecturer in 1999–2000. He also is a distinguished fellow of the Freeman Spogli Institute for International Studies at Stanford. In 1990–91, he taught at Harvard, where he is also an associate of the Olin Institute for Strategic Studies. He was a visiting lecturer in 2002 at Dartmouth College and in 1998 at Princeton University's Woodrow Wilson School. He was a professorial lecturer at Johns Hopkins (School of Advanced International Studies) in 1982–1984. He has taught at the University of Munich and the Salzburg Seminar. His scholarly work has appeared in many books and in journals such as Foreign Affairs, the National Interest, International Security, and Foreign Policy as well as in professional journals in Germany, Britain, and France. He is the author of The Limited Partnership: Europe, the United States and the Burdens of Alliance and coauthor of Eroding Empire: Western Relations With Eastern Europe. His most recent book is The Future of International Politics: The Great Powers (1998); forthcoming is Über-Power: The Imperial Temptation in American Foreign Policy, to be published by W.W. Norton.